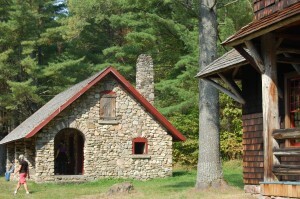 Great Camp Santanoni in Newcomb was built for Robert and Anna Pruyn of Albany beginning in 1892. The estate eventually included 12,900 acres and nearly four-dozen buildings. Adirondack Architectural Heritage (AARCH) director Steven Engelhart and 2012 intern Charlotte Barrett will lead a tour of the site on Friday, June 28, 2013 that will feature the launch of a new guide to Santanoni, authored by Barrett. The day will include stops at the Gate Lodge, the 200-acre farm, and the Main Camp on Newcomb Lake where well see ongoing restoration and learn about the conservation planning and restoration work. The Santanoni Preserve is owned by New York State, on the National Register of Historic Places, and is a National Historic Landmark. AARCH has long been associated with the protection, interpretation and restoration of this Adirondack treasure. The round-trip walk is 9.8 miles on a gently sloping carriage road. The tour begins at 10 a.m. and ends at 4 p.m. The fee is $20 for AARCH members and $30 for non-members. Participants will receive a copy of the newly released guide. Reservations are required and may be made by calling AARCH at 518-834-9328. There will be another tour on September 7. Adirondack Architectural Heritage is the nonprofit historic preservation organization for New York State’s Adirondack Park that was formed in 1990 with a mission to promote better public understanding, appreciation and stewardship of the Adirondacks unique and diverse architectural heritage. Seem to recall going to a place called, “Camp Newcomb” as a young Boy Scout in late 1940s early 1950s wondering if this was the place. My troop also camped at a place called “Camp Sanitas” that was owned by the NYC Department of Sanitation union. It had train cabooses for its lodgings.